Awesome lady leads in manga for girls! So there I was in my one of my film theory classes day after the Oscars aired and my teacher showed us this video on youtube that talked about something called the “Bechdel test.” I highly suggest watching the youtube video through the link but to sum up, it's a test that determines whether a movie or tv show has use of female characters. It requires that two women talk to each other for 60secs about something other than a man. Then I started hunting and… Graaah! It’s difficult! Even calling up Wallie and asking for help got the “Oooh that's hard” response! And yes I do realize that girls read shounen and sienen and that there are plenty strong girls and women in them to be found as well, but that does not change the fact that these series ARE aimed and advertised at boys and men. 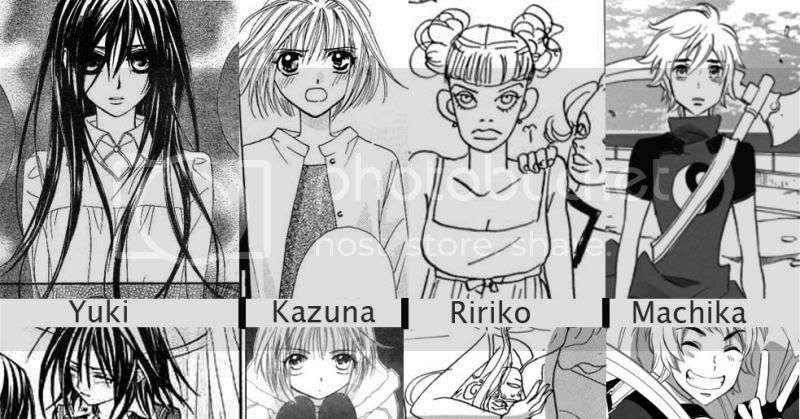 And I wanted to see what strong ladies were in manga aimed at us females. (Sorry Kaoru from Rurouni Kenshin, I love you, but you only fight in the first book and need to be saved even then) And also (sorry Ouran fans) I am not counting reverse harem manga or (sorry Harada twins from DN Angel) not counting it unless they are a main character with a good portion of the story seen through their eyes. So I am going to count down my favorite strong female characters in manga aimed at girls and women! Read these and feel free to share your own favs, or thoughts about the Bechdel test in the comments!!! Special thanks goes out to Wallpaperotaku who helped me keep my sanity making this list and gave me some great suggestions! Princess Primula from Apothecarious Argentum, sadly doesn’t make the list since not enough of the manga is from her point of view. However her character growth is fun to read and she makes one choice in particular towards the end where (MILD SPOILERS) she picks her country over the man she loves and I give her mad props for that. Its something I don’t think I could do. Tohru from Fruits Basket. I still haven’t decided how I feel about her and whether I can over look some plot issues I have, despite my love for the series. From the people I talked to about Tohru, everyone seems to be split on whether she is or isn’t, (half say yay the other neigh) but Wallpaperotaku made a strong case for her so I am giving her a nod as she is a tough cookie if a passive person. Ok now to the main attraction! In my personal opinion of the shoujo and Josei I’ve read the ones I feel have strong female characters! Another incomplete series with a pretty typical “girl ends up living with guy she barely knows but doesn’t like on first impression” manga. However I personally believe this series has quite a bit of bite and gives not just Kazura but the other girls she meets a lot of attention. She also makes a lot of difficult choices and sticks to her guns a lot. Once again her problems aren’t quickly solved and I really buy the budding romance and drama. This is a MATURE josei manga that follows the story of a model striving for perfect and coming to the realization that the world of modeling is slowly throwing her away. This manga is a worth while read that consists of EVERY main character being female. Even Ririko’s plastic surgeon is a woman. Not only is it very female focused it also deals with image issues that all girls experience in a very creative way. I suggest this only to those who feel they are mature enough to handle it and to read my full review on the series on Beloved Blood’s Rein of Darkness world here. I will almost assuredly do a full review of this series at some point since it is one of my all time favorites. For now though lets look at Machika! She could be written of as weak on first glance but once again its in her determination and growth as a person throughout the series that makes her a strong character. A perfect expample is when she meets the villain she’s been searching for (not Rain) and realizes the classic confrontation she’s imagined is far from the truth and the worlds more complex than she thought. This series also features several other fantastic female characters including the villain Sheriam, and a friend of Machika she meets along the way. Sheriam in particular is a favorite character of mine! You know why she’s doing what she’s doing and even that she knows it’s wrong, and why she doesn’t care anymore. The only short fall is this series splits the focus between male and female characters although the majority is from Machika. Despite that it is still a great manga with some great girls! Once agian feel free to share your own opinions and favorites in the comments!!! “Come with me and we’ll go on a journey to discover the meaning of goodbye.” This quote from the anime movie “Children Who Chase Lost Voices” sums up the general feeling of this movie nicely. I bought this DVD and a lark from amazon without watching it first because it look pretty. I don’t regret it! It’s awesome!!! The plot follows a girl as she goes on a journey to Agartha, the afterlife, to bring her friend back to life. She joins up with man who is also looking to resurrect somebody and a boy from Agartha who is trying to stop her and together they learn about the true meaning of life and letting go. The story is incredibly engaging and wonderfully told. The creatures in this fantasy have a distinct look and are really amazing to look at. I often find that movies that take me to an after life end up letting me down with their visuals, (as the afterlife needs to be amazing somehow) but I can honestly say I felt that Lost Voices had a fleshed out and beautiful idea of what the underworld might be. The visuals and plot take a lot of cues from Greek mythology and I think that that only makes the whole movie a stronger piece. I simply can’t talk about this movie without also talking about the absolutely beautiful animation! Every scene is just stunning and the movie is worth watching just for that! The images are unique and create a mood all their own. Every scene is pure eye candy and it has an amazing story! The director Makoto Shinkai definitely deserves more attention! (Actually the back story of how his first movie Voices of a Distant Star was made is really fascinating, but I’ll focus on this one for now) This movie is comparable to any Miyazaki work in beautiful artwork and story, however Shinkai has his own flare that raises him to a level that would not put his work as a copycat, but rather as an equal. I feel he’s an animator and director to keep an eye on. His other works including 5 centimeters per second and Voices of A Distant star are now officially added to my watch list and I can’t wait to see more!!! Sorry I been awhile since I’ve posted anything… But I am happy to say despite that this world has had a healthy just over 300 views! ^-^ So thank you all! First up is Akuma Ga Kitraite or The Devil Has Come. This is an extremely cute oneshot about a high school boy who has a scary face and demeanor who has been trying to confess his love to a sweet innocent girl in his class. He has been writing her confession letter after confession letter trying to express his feeling but has never been able to work up the guts to actually give her any of them. Then one day he saves her from getting hit by a baseball (and after freaky out due to his scary face) she thanks him for his help and a door opens for him. Will she accept his love?! If you like a cute little story that wont take up much time to read and will warm your innards this is the one shot for you! ^-^ Trust me its very funny and as sweet as sugar laced honey! Ok I CAN’T say more without ruining it! Sorry you’ll have to go read it for more! But trust me its worth it! Writing a one shot that's only 10 pages and managing to make it this complete and amazing is no easy task and you won’t regret the read! Plus my next anime review! Possibly also to be posted today! Ao No Exorcist, also know as Blue Exorcist, starts out with a pretty standard plot. Half demon boy, evil dad, dead mom, murder, boy gets taken in by a group of exorcists. See? Nothing-new there… It’s as the plot progresses that this series begins to stand out. The depth of the characters, the main character Rin in particular, is suburb! All of the characters have pretty realistic reactions to the happenings around them and the mystery of wondering what’s going to happen next is always a rush. At the school for exorcists Rin has to hide his half demon identity or risk being killed by other exorcists. This makes for some exciting tension between him and his friends. Again this is a pretty normal sounding shounen manga, and for the most part it is. For me I fell in love with the tension and realism of reactions of the characters. (I can’t go into more detail without terrible spoilers…) I love that it feels like the author has a real idea of where they want the story to progress. As far as shounen goes this one stands at a level that is very accessible by not being too bloody or gruff, but also not being too kiddish and light. The artwork is very pretty in my opinion and the story is a fun shounen with some punch! This series is ongoing so I can’t say with complete confidence that it will have a good ending, (I can’t put any series on my favorite list if I haven’t seen/watched it in it’s entirety) but I think it has great promise to remain a great series! Cleanliness Boy? A shoujo this time! Another review! And my first manga review at that! Keppeki Shounen Kanzen Soubi, which translates into something like “Cleanliness Loving Boy Perfectly Equipped,” is a shoujo manga by Tobina Touya about a boy who has an extreme case of Mysophobia or “an abnormal fear of dirt or contamination.” (According to medical-dictionary.thefreedictionary.com) The boy, Senda, is so afraid in fact, that he often wears a hazmat suit to school, (say whaaaat?) but then he meets Aiuchi and slowly but surely he starts to come out of his shell to be with her. Also even though it is a pretty straightforward romance story it has refreshing twists and challenges for the characters to overcome, which is something I like. I dislike it when shoujo stories are too perfect after all, and the bitter in this is just the right amount without cutting back on the sweet. 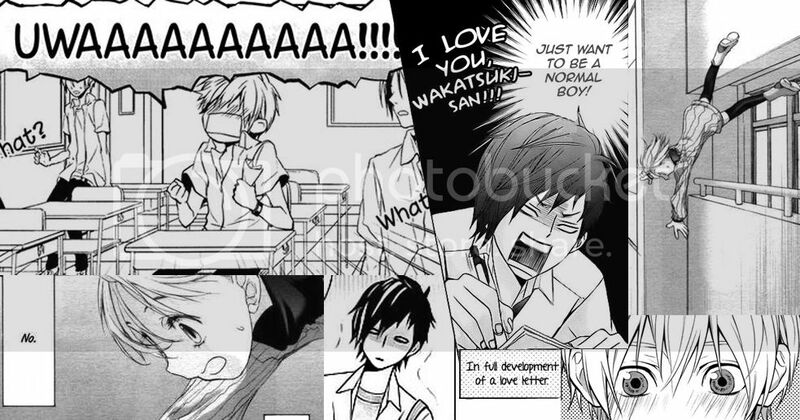 If you are a shoujo fan this 10-chapter manga is not one to miss! And even if you’re not that huge shoujo fan I think it still has a lot to offer and is definitely worth checking out! Anyways I'll be back agian soon with another review!